Granite vs glass tile – comparison chart. Natural look of stone. Each granite tile is unique with consistent or inconsistent color pattern. Good for any interior or exterior renovation projects. Granite tiles could be used as flooring or walls covering material. Glass tiles could be used for many projects. It is one of the best choices for tiling kitchen backsplashes or creating unique designs on walls. 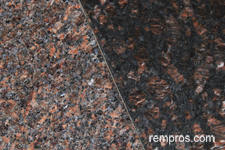 Granite is porous material, but with periodical sealer applications granite tiles have good stain resistance properties. Properly sealed granite won’t be damaged by water staying on tile surface for couple hours. Glass has excellent water resistance ability. Glass tiles do not change in color under direct sunlight or any other conditions. Granite tiles are extremely durable. Depends on product. Some glass tiles rated from 0 to 1 on PEI abrasion scale can be installed on walls or ceiling only while others are hard enough for floors and can easily withstand even heavy traffic. Surface of granite tiles is extremely hard to scratch. Good resistance to frost. Granite tile can be used for outdoor applications in cold climate zones. 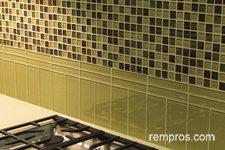 Most of glass tiles have excellent frost resistance ability. Lifetime with proper installation and maintenance. Over 100 years with adequate care. Most tile producers provide 1-year warranty which cover manufacturer defect. Boxes 12” x 12”, or 18” x 18”, but other dimensions are available as well. Many glass mosaic tiles are set on 12” x 12” mesh and sold in boxes containing 5 tiles each. Depends on thickness. 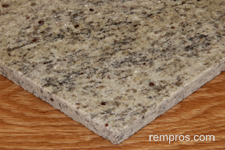 One square foot of 3/8” thick granite tile weight about 6 pounds (2.7 kg). Greatly vary. 1/4” thick glass tile weight approximately 3 lbs. 0.16 in. – 0.50 in. Significantly vary, but granite is not a cheap tile. Prices greatly vary and some glass mosaic tile might be quite expensive. Cost of granite tile installation typically lower than setting glass tiles. 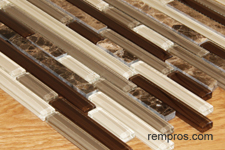 Cost of glass tile installation often higher in comparison with granite tile installation. Granite tile installation is moderate difficulty project. It could be a hard task to install glass mosaic while creating unique pattern on walls, but some glass tiles are relatively easy to install. Depends on work complexity. On average, basic installation of 80 square feet of 12” x 12” tiles on bathroom walls and 60 square feet on floor is a couple days project for an experienced tile setter. Preparation work might take another day. Experienced tile installer normally is able to complete tiling 27 – 30 square feet kitchen backsplash with set on mesh glass mosaic tile in one day. Complex work might take a few times longer. Granite and glass are great tile options. Glass tile is widely used for creating stylish patterns on walls while granite is a perfect option for both walls and floors applications. Which tile is better to purchase often depends on personal preferences. Glass and granite are both extremely durable and long lasting products which required very little maintenance.